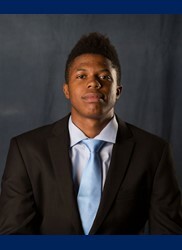 Strengths: Justin Patton has tremendous speed and quickness for a big man, which gives him the ability to play up-tempo and run the floor. It also gives him the ability to switch on pick-and-rolls and defend perimeter players. He is a traditional back-to-the-basket center offensively, and has a variety of post moves that he uses to score. Post moves seem to be a lost art in the NBA today, but Patton is the type of player that you can isolate him in the post and he will create an easy bucket for himself or a teammate. His length and athleticism helps him finish at the rim and grab rebounds. Weaknesses: At just 215 lbs. or so, he still has room to fill into his body and add strength. Banging with big men down low defensively and on the glass is his biggest weaknesses right now, as he often relies to much on his length and athleticism to rebound, as opposed to boxing out his man. He redshirted his freshman year and did put on some weight in that time, so if he continues to do that then he can be a starting caliber NBA center for many years to come.